Don’t take it so seriously, I’m just taking the piss. The word “take,” much like the word “get,” is so commonly misused in English by Portuguese speakers. The main reason for this is because the word “tomar” has so many uses in Portuguese. For example, tomar café, tomar remedio, tomar um banho, and so on. 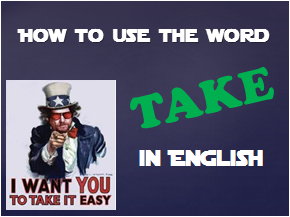 Much like in Portuguese, English also has many uses for the word “take” but quite they have different meanings. “To take time.” In English we use the word “take” when talking about time, much like how you use the word “gastar tempo” in Portuguese. The most common way we would use this is when you’re asking someone a “how long” question, or explaining the amount of time it “takes” to do something. How long does it take to get to Sao Paulo? It took me 1 hour to get to work because of traffic. “Take me to the candy shop.” Most of us know this track by my homeboy Mr. 50 Cent, where he’s using the word “take” just like the literal translation of the word “levar” in Portuguese. To take someone, or something to a place. I took my old lady (my mom) to the dentist. He had taken his pregnant wife to the hospital. “To take medicine.” In English we also say to take medicine, just like in Portuguese (tomar remedio). But be careful because although we say take medicine, we don’t say to take in reference to beverages. I took a lot of asprin for my headache. I took a liter of water because I was dehydrated. I drank a litre of water. “Take the bus to work”. This is more common with public transport, we use the verb take to express the mode of transport we use to get somewhere (bus, taxi, train). Why didn’t you take a taxi if you were drinking? “It takes a lot practice to master a language.” This is used a lot when talking about what we need to achieve something, whether it’s a personal characteristic, or something physical. It takes a lot of dedication to stay on a high carb raw vegan diet. It took a lot of work and help from the community to clean up after the earthquake. Because “take” in English and “tomar” in Portuguese have so many uses, it leads to many mistakes and misuses of the word when speaking the other language. From my personal experience with students, and mistakes I’ve made when speaking Portuguese, I’ve narrowed it down to the 4 most common mistakes. “Take” is often used instead of the word pickup (buscar). I hear this mistake a lot in Brazil, many people say, “I’m going to take my children from school.” Take would only be used when you leave your children at school (deixar na escolar). Because Brazilians are so friendly and always ask each other to go out and have some drinks, that leads to another common misuse of the word take. “Hey Chad, let’s go take some beers this weekend?” hum, I didn’t know what to say, “take the beers where?.” So, we would say “get” some beers or “drink” some beers. The English language has so many collocations with the word “take.” When it comes to collocation the only way to know them all is to study and memorize them. So I’m going to give you 5 of my favorites, and some links to other resources. Take it all-Adele. In this song Adele is telling her ex-lover to take it all. This can be translated literally in Portuguese, she’s telling him to take all of his things with him because she doesn’t want anything to do with him anymore. Whether you’re taking advice from someone, taking the bus to work, taking a break or taking it easy, you’re going to see the word “take” has many meanings in English. So, like I tell my students, try keeping a vocabulary journal and start writing down all the different uses of the word. The more you take notice of the word the easier it’s going to be to memorize it. Take care Real Life English, and if you haven’t already, don’t forget to join us at the Real Life English Facebook Community.